The Goodpush Skateboarding Alliance is an initiative by Skateistan to support and share knowledge among social skateboarding projects worldwide, so that we can make a bigger impact together. Globally, there are now more than 100 skateboarding-for-youth-development projects working in 50+ countries. The Goodpush Alliance vision is to become a network for these projects, promoting joint knowledge-sharing and collaboration. Goodpush offers training and advice to grassroots skateboarding projects via on-site workshops, support calls, online resources, and awards. The Goodpush Alliance is supported by a WeWork Creator Award. And building a network of support among social skate projects. Skate NGOs are continuously innovating to have a bigger impact in their communities, and by working together we can strengthen each other’s work, increase the data showing our impact, and build support for all projects using skateboarding as a tool for social change. During Goodpush's pilot phase in 2018 we selected three partners for a financial award and tailored consulting: Make Life Skate Life (global), 7Hills (Jordan), and SkateQilya (Palestine). Over a six month period, our partners came to Skateistan Cambodia for a weeklong workshop, hosted a Goodpush training visit to their project location, and took part in support calls with Skateistan staff. 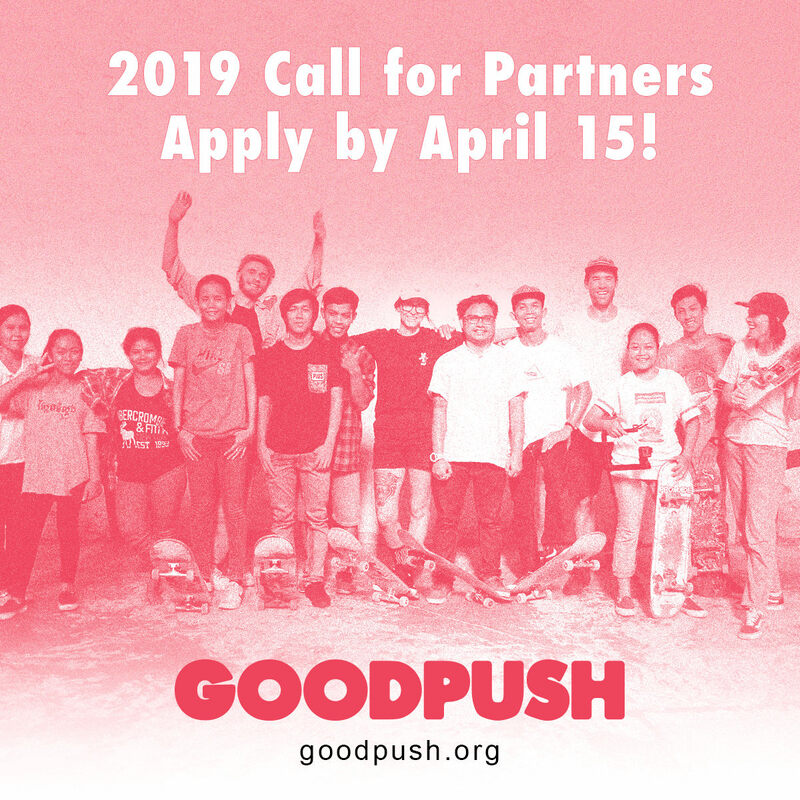 In 2019, the Goodpush Alliance will announce a call for partners, the first Goodpush conference at a Skateistan Skate School, and new online resources. Sign up for the Goodpush newsletter for updates on these opportunities! The Goodpush Toolkit offers free guidelines and templates to give community-based projects a head start on running safe, high-quality skateboarding and creative education for children and youth. It features videos, guidelines, audio interviews, and open-source tools. The Toolkit is aimed at anyone involved in running a skateboarding for youth development project. It includes resources for those who are just getting started, as well as for more established projects looking to build up their skills and organizational capacity. Skateistan is the first international development initiative to combine skateboarding with educational outcomes. Founded in 2007 in Kabul, Skateistan now works with 2500 children across Afghanistan, Cambodia and South Africa, including more than 50% girls. What started with a board and four wheels is now an award-winning, international NGO with the mission of empowering children and youth through skateboarding and education. Skateistan’s vision is creating leaders that make a better world. If you’d like more info on the Goodpush Alliance, get in touch!